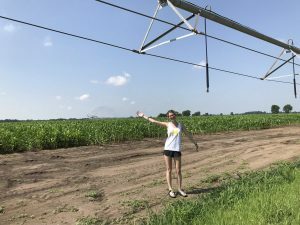 KBS 2018 undergraduate summer researcher Paige Drippe is a senior at University of Michigan. 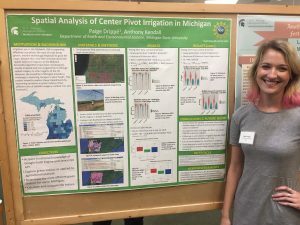 She wrote about her NSF REU project working with the MSU Hydrogeology Lab. Collecting some ground truth data on center pivot irrigation use in Michigan. When I entered the Research Experience For Undergraduates (REU) program I had the expectation that it will be exactly that – a research experience. I saw it as an opportunity to play grad student for 10 weeks, and expected that once the last day rolled around I would simply pack up and go home. I was lucky enough that that was not my experience. I was the only REU in my lab, and only one of two REU students on the main Michigan State University campus in East Lansing. I did get to play grad student for 10 weeks, but it was even more than I was expecting – I was thrown into a world of coding, one I had never experienced. My project was focused around manipulating satellite data to calculate green indices for three different satellites, in the relatively new data platform, Google Earth Engine. Unlike many of my counterparts, I was not collecting samples on MSU property, but instead sitting at a computer working through every single “syntax error” I encountered, and trust me, there were a lot! At many times I felt like I was just treading water and trying to stay afloat. Despite this, I absolutely fell in love with what I was doing. I knew I was interested in remote sensing, and this REU gave me the chance to confirm that. I learned more than I ever thought possible in 10 weeks. Just as I was hitting my stride and really understanding the project, it was time for the symposium where I had to present my research. As I sat there at my desk analyzing data and creating my abstract and poster, I couldn’t help but think what I would have done differently if I’d had more time. There were so many more indices to calculate and so many improvements to be made. Not to mention how much farther this project could go; I had merely scratched the surface of an incredible project. Nonetheless, I presented and everything went well. Afterwards, my mentor asked me if I would like to stay on with the project and finish it to the end, and if I would like to present my findings at the annual American Geophysical Union Conference in Washington DC! What had started out as a summer project suddenly became a huge part of my life, and I couldn’t be happier.